Living Stones Christian Centre, Kilmartin, Argyll (from October 2015) N.B. Living Stones Christian Centre closed in February 2018. At the end it is for the viewer of any artwork to make up their own minds as to significance, relevance, appeal and whether or not it is good or bad. Opinion and personal disposition must enter the interactive equation. With a complex work such as this, it is perhaps more easily dismissed as obscure and elitist because it needs interpretation. This ignores the operation of other unseen mechanisms, where some things will seep into our unconscious unbidden and a measure of appreciation or disapproval will be awakened in any event. That at least is my hope. The painting is in the form of a triptych – 3 panels, which can be seen individually or together; left to right, or right to left. It is intended to represent some personal thoughts and understanding of a walk with The Lord, and underwent quite a number of changes and revisions during it's creation. The middle panel was made first, in response to the request for a work to be entered into an exhibition IN THE FOOTSTEPS OF COLUMBA in the summer of 2013, but even initially the idea was for this to be part of a larger work. 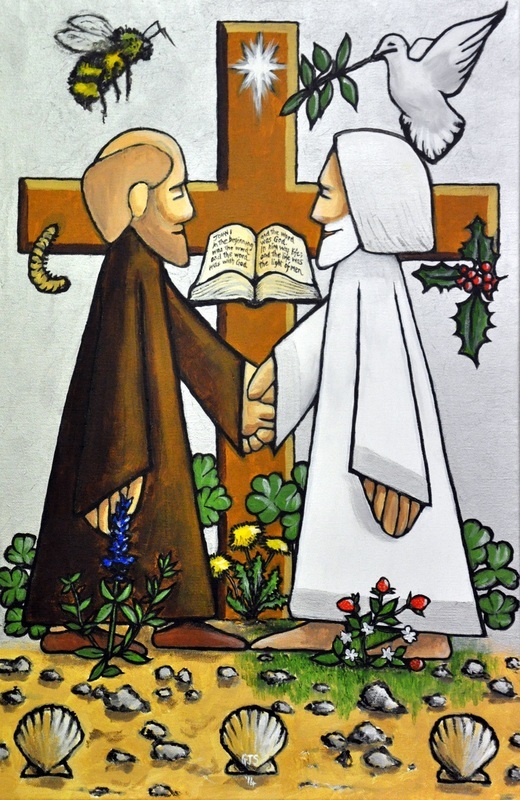 The idea was for paintings in the style of a stained glass window, using the idea of St Columba as a representative of ourselves – meeting with Jesus; walking with Him and coming into the fullness of a relationship with Him. Motifs would be used in the style of medieval and renaissance painters that would illustrate different requirements or steps in our walk with Jesus. The colours also would be indicative of spiritual ideas – e.g. gold to represent the Divinity; silver for the redemptive work of Christ and so on. This talk is firstly an interpretation of the paintings, but also an exhortation to press in to Jesus, and press on in our commitment to faith. The triptych was intended to be viewed from God's perspective; that is, from left to right starting with the gold panel depicting the heavenly realms; meaning that we begin our journey from right to left, beginning with the silver panel. This also takes up the Biblical idea of Christ's journey following the Sun as a walk from East to West. Our usual practise however (at least in Western Art), is to see these from left to right so it is easier to place them the other way round. A third way of viewing these might be with the gold panel at the top, above the blue, over the silver. As work progressed, the idea arose of showing a progression, not only in the elements depicted, but also in the style of painting employed. Thus The Way is very much created to resemble a stained-glass window. It is formal in execution as well as in idea. The Truth is softer in tone. The leaded lines are blurred and it shows things in a slightly more naturalistic way, as our relationship with Jesus blossoms and we are led on from legality and religious form. There is also the paradox that when we know Jesus better and the natural loses its appeal to be replaced by spirituality; the Spirit Life becomes more natural for us. Natural reality becomes Spirit reality. The Life takes this a stage further. Black leaded lines are non-existant, and the softness becomes a mistiness. Certainly there is less detail the attempt being made to show things as through a glass darkly. This is the panel I am least happy with in its completed state, as it least equates with the visual image in my mind. I may try it again in another work. Ps 89:11 The heavens are thine, the earth also is thine: as for the world and the fulness thereof, thou hast founded them. Ps 90:2 Before the mountains were brought forth, or ever thou hadst formed the earth and the world, even from everlasting to everlasting, thou art God. Each panel has the Cross as the central design, around which the elements are arranged, but only in The Way panel is it depicted in traditional manner. As 'the walk' progresses, the formality of the image softens to depict a move away from religious form towards a spiritual relationship – living under law becoming living under grace, moving to abiding in Him - our maturing in understanding as we walk onwards, but also shows a deepening relationship as Christ is less of an abstract connection and more a personal relationship. 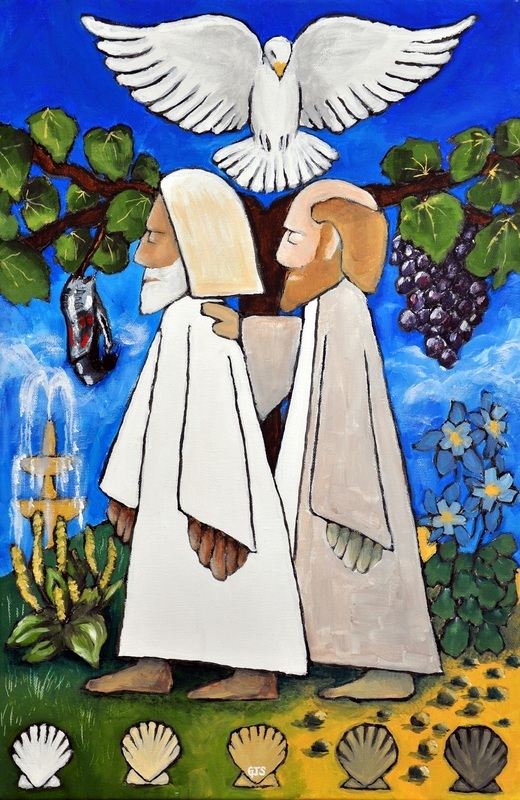 In The Truth panel, the true Vine is shown, with the Holy Spirit Dove as the 'head'. In The Life panel the figure of Christ himself takes that part in the image. The ground and the view of it has significance in that it moves from stoney ground (our barren life without God), through green grass (life that only The Lord can provide) to no ground or horizon at all, just divine gold (eternal life in the heavenly realms). ending with GOLD, interpreted as representing God, divinity, or Christ as divinity. The central figures are largely self explanatory. In white robes (with silver and then gold) we have Jesus Christ as He appears to us where we are; but moving from east to west at all times (here shown as right to left). The other figure is Columba – representing all who accept Jesus – initially walking in the opposite way to Jesus, but then turned around and following; his garments gradually moving from the brown of the earth and becoming lighter with parts of white as he is changed. Finally Columba disappears as only Christ glorified in His people can be seen. Between the two figures in The Way is a Bible open at John 1: 1 ¶ In the beginning was the Word, and the Word was with God, and the Word was God. 4 In him was life; and the life was the light of men. The Scallop shells are shown as a frieze at the bottom of each painting as these are symbolic of pilgrimage, having become associated with pilgrims journeying to the shrine of St James of Compostella in Spain, where these shells were used for a form of wayside communion – the rounded portion of the shell being used as a cup for wine; the flatter section used as a plate for the bread. finally becoming 7 in the third image to represent completeness, fullness, perfection and wholeness. The shells also change their appearance from a mixture of light and dark (revealing the mixture of right and wrong within us); through a cleansing from the darkness, as holiness and righteousness is worked in us; finishing with the white of purity (only without blemish are we acceptable in the presence of God). The Way has the Star of Bethlehem on the Cross; a heavenly light that heralded Jesus' birth. Thus it signifies here, our own 'new birth' when we accept Jesus. Stars also are symbolic of sons of God; thus stars are what we aspire to, and the star is the Son of God; Jesus. In The Truth, the star becomes the Dove of the Holy Spirit, in white to signify purity and holiness. As The Truth shows our walk in the Spirit, The Holy Spirit takes that place as it is our link; our channel of communication between ourselves and God. There is a Dove bearing an olive branch over Jesus head in The Way meaning that He always brings peace, and that He always has the Holy Spirit within. At this point in our walk we are diligent and do good works, represented by the Bee. As the bee produces honey it also represents an eloquence in speaking – sweet-talking, and a hive of bees is symbolic of the church. In The Way – on the left – is a Caterpillar, which becomes a Chrysalis in The Truth, and finally a Butterfly in The Life. The Butterfly is a recognised symbol of the Resurrection, thus it's two previous stages suggest the change in us as Jesus works in us. The sprig of Holly and Berries = Jesus' crown of thorns; the berries representing the drops of blood; together showing the Passion. Strawberry = the colour of the fruit symbolises the blood (they also have a heart-shape), while the seeds represent the saints. As fruit, they reveal the righteous man (Jesus) – producing fruit after their kind – and are symbolic of good works. The strawberry flower is white representing purity and holiness. The Dandelion = one of the 'bitter herbs' is a symbol of Christ's Passion. Hyssop = grows in solitary places and among stones and represents humility. It is a purgative and suggests innocence regained and baptism. See Psalm 51:7 ¶ Purge me with hyssop, and I shall be clean: wash me, and I shall be whiter than snow. The cluster of Grapes growing from the True Vine = the gathering of the Saints into the True Church of Jesus Christ, but also, and more obviously they represent the wine (the life of Christ). Wine is made in a winepress and the grapes are crushed until the grape juice is produced and ferments. This shows the trials and tests we go through to produce the life of Christ in us. Columbine = latin name columba meaning 'dove', is set behind the Columba figure in The Truth panel. The form of the flower is like a dove, and it has 7 flowers on a stalk. The Catholic Church thought that this represented the fruits of the Spirit. 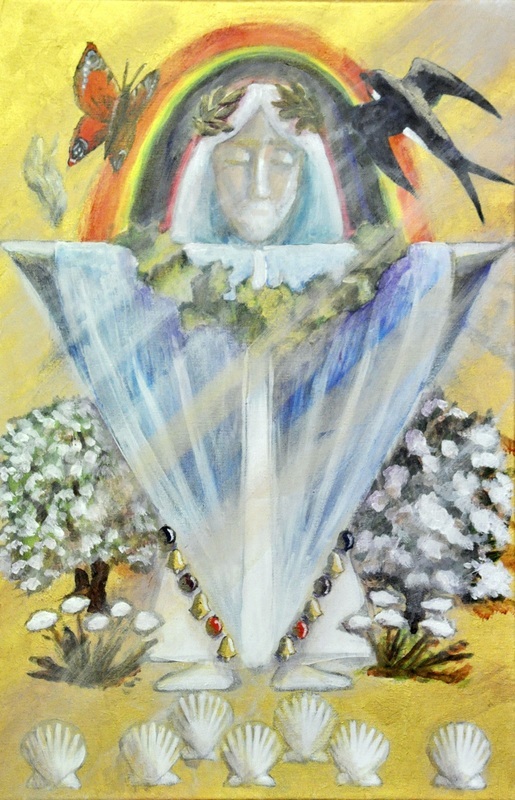 The Fountain = is, like the dove a symbol of the Holy Spirit. The Dove because it has monocular vision, the fountain because 'living water' rises from a single 'eye' or nozzle. Mt 6:22 The light of the body is the eye: if therefore thine eye be single, thy whole body shall be full of light. The Plantain = also know as 'Waybread' to pilgrims; it is symbolic of the 'well-trodden path' to Christ. The Swallow = another symbol of Resurrection (like the butterfly). It used to be thought that swallows hibernated and would appear 'out of the earth', thus the idea of resurrection became attached to them. The Laurel leaves = is the crown of life. The translation of the word for crown reveals that it was the accolade given to the winner of the games, and was in fact a crown of laurel leaves. Re 2:10 Fear none of those things which thou shalt suffer: behold, the devil shall cast some of you into prison, that ye may be tried; and ye shall have tribulation ten days: be thou faithful unto death, and I will give thee a crown of life. Ivy = like the laurel is evergreen and syymbolises eternal life, and because the Ivy clings to its support it reveals undying affection and faithfulness. There are 17 ivy leaves shown in the painting; the number of victory. There are two trees shown in this painting. The Myrtle and The Almond. The Myrtle (Isa 55:13 Instead of the thorn shall come up the fir tree, and instead of the brier shall come up the myrtle tree: and it shall be to the LORD for a name, for an everlasting sign that shall not be cut off. See also Zechariah 1:8-10) has from earliest times been seen as a symbol of love and compassion, because it is evergreen and because of its heavenly scent. The Almond (Numbers 17: 8 ¶ And it came to pass, that on the morrow Moses went into the tabernacle of witness; and, behold, the rod of Aaron for the house of Levi was budded, and brought forth buds, and bloomed blossoms, and yielded almonds.) is a symbol of divine favour or approval. The word for almond also means to be wakeful, and to keep watch over. It is also a tree early to come into flower and thus has great significance for those called to be among the first fruits of His people. The Bells and Pomegranates along the hem of the High-priestly robe. (Ex 39: 24 And they made upon the hems of the robe pomegranates of blue, and purple, and scarlet, and twined linen. The bell is a symbol of the call to worship, while the pomegranate because of its many seeds represents the cluster; the gathering of the saints. The colours also signified the divine; the heavenly spirit realms and kingship, or royalty. The feet begin as four in The Way, representing the creation of the re-birth. As the pilgrimage continues in The Truth, only three are shown as our walk becomes more Godly and overlaps with Jesus' walk. Finally only two are shown in The Life. Two is the number of witness, and here we become witnesses in the earth to the Christ-life. Also in The Truth panel, there is ONE Dove, TWO Persons, THREE Feet, FOUR hands and FIVE Shells. Make of that what you will. I know what I intended it to mean, but maybe the mystery should be left with you. I believe that with the help of The Holy Spirit the work will speak other things to other people over time. That is my hope anyway. * 3 is the number of the Divinity; the Trinity; the Great Feasts of Israel. All things from God are usually spoken in three ways.